I went to the National Beauty Blogging Event (NBBE) last week, where a number of brands and industry experts took turns in presenting to an audience of beauty bloggers. Among the line up of speakers was Gavin Duffy, an investor and Dragon on the Irish Dragons' Den. 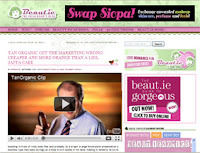 While I was particularly interested to hear from Gavin about investing in beauty companies (an exclusive interview with Gavin will appear on this blog shortly), what he was actually there to talk to the beauty bloggers about was his latest investment – beauty brand TanOrganic. Firstly, I was intrigued by Gavin’s decision to do the presentation on TanOrganic himself, instead of brand owner Noelle O’Conner. But what what was really interesting to watch was the very shrewd way in which Gavin chose to address the bloggers. 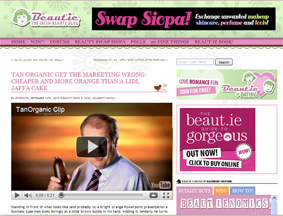 Following a dire advert made by TanOrganic, Beaut.ie, a respected Irish beauty blog, picked up on it and slated the advert and its concept, saying ‘it screams cheap, it screams orange – surely the very last things TanOrganic would want to convey’. This blog in turn generated a whole heap of reader comments that were in general agreement with each other that they weren’t impressed and wouldn’t be trying out the product. He finished the presentation by telling the beauty bloggers that he would love it if they could help TanOrganic when it launches in the UK this autumn, and thanked them for ‘doing us the honour of coming to listen to the TanOrganic story’. By – 1. Recognising and referencing the influence of beauty bloggers and 2. Holding his hands up when he made a mistake, Gavin had a captive audience. Whether the bloggers appreciated Gavin’s approach or thought it a bit much, I have already started to see TanOrganic reviews appear on beauty blogs, so I can only assume it’s working. I have been told that there will be a video of Gavin’s presentation available soon, so if I manage to get hold of this I will post it on this blog post for you to watch in full. On a side note, I was actually very interested to hear about the TanOrganic self tan range, which sounds revolutionary in that it is 100% certified organic – in part achieved by using an aloe vera base, which by happy coincidence apparently got rid of the biscuit smell usually associated with self tan. I'll leave the reviews to the beauty bloggers, but I'll watch the brand's progress with interest. Following a successful launch in Ireland, TanOrganic is looking to launch in England this autumn. What do you think of Gavin’s approach to beauty bloggers?